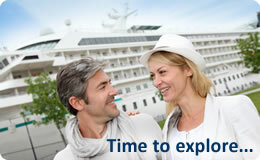 Cruises - Cheap cruises, luxury cruises and late deals from ABTA bonded Cruise Village. Low fares on Caribbean, Mediterranean & worldwide cruises. The Cruise Village™ is an award winning 4th generation family business, established over 55 years! We are specialists in all types of cruises including late deals, luxury cruises, small ship cruises & river cruises. Due to our relationships with all of the world's leading cruise lines we can offer our clients thousands of cruise holidays including Alaska Cruises, Caribbean Cruises, Canary Islands & Mediterranean Cruises, USA & Canada Cruises, Australia & New Zealand Cruises and Baltic Cruises plus many more worldwide cruise holiday destinations. Our dedicated, friendly, award-winning cruise team are available to take your call until 9pm every day! Please give us a call and experience our "Can do" service. 10 Nights on Oceania Marina! We have some fantastic cruise offers with all major cruise lines like P&O Cruises, Royal Caribbean, Princess Cruises, Cunard Line, Celebrity Cruises and many more. Below we have listed our best online cruises, look out for cruises with free onboard credit, free car parking in Southampton plus our amazing Cruise Village fares, simply click one one of the cruises below for more details. Don't see anything you like, then why not give our friendly team a call today and we will be happy to find you a perfect cruise holiday.